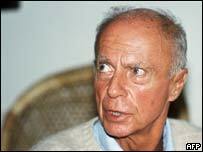 French novelist and Nobel Prize winner Claude Simon has died aged 91. He was a leading member of the "nouveau roman" (new novel) movement. His books won critical acclaim, but never became popular with the general public. His best-known work is the 1960 novel The Road to Flanders. Prime Minister Dominique de Villepin said France had lost "one of its greatest authors". Simon died on Wednesday, but the death was only announced on Saturday - when he was buried in Paris. Born in Madagascar in 1913, Simon led an adventurous life. He fought with the Republicans in the Spanish Civil War, was captured by German troops during World War II and later joined the French resistance. After being awarded the Nobel Prize for literature in 1985, he said: "People will get to understand my work sooner of later. This is nothing new, that some authors are considered difficult."